Bell rings. Lesson starts. One, two, three. Ek, doh, teen. Ein, zwei, drei. Uno, dos, tres. Onnu, reendu, moonu. Satu, dua, tiga. Enas, dýo, tría. That’s it for this learning session, remember them, there is a pop quiz somewhere in this post, and your prize is a top-notch cup of coffee. There is one place that offers nothing less than glistening sights, lantern-lit nights, sweet sounds of bells and coffee-scented air. You are indeed in the right place with me. 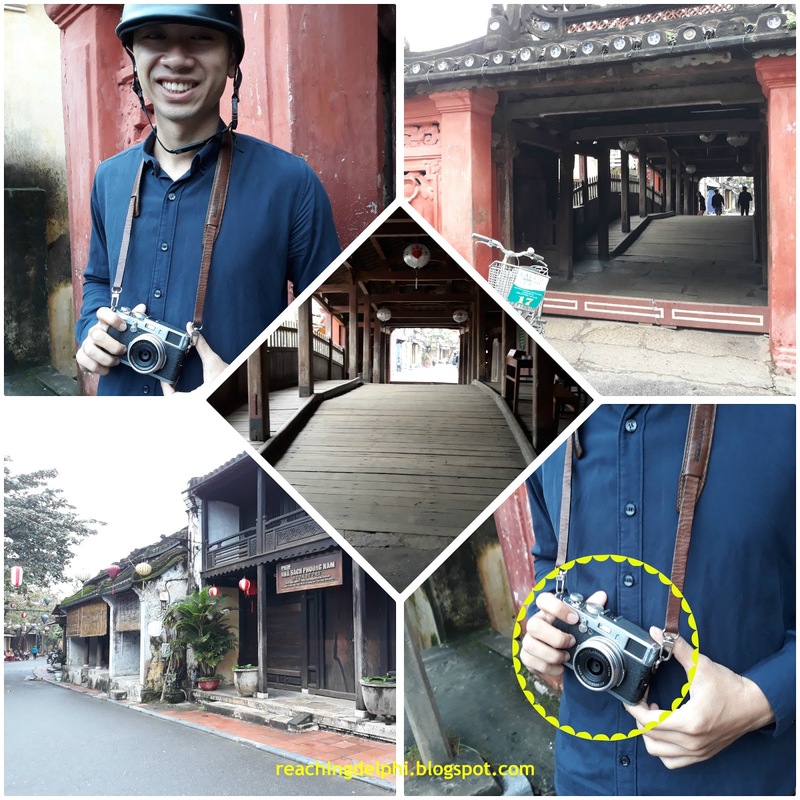 Today, we meet in the perfect picturesque town of Hoi An. Enjoy a cup of coffee (or tea). The traditional Vietnamese Phin Coffee kicks off today's tour. Look, I missed the translation for a four. If you spotted that, good, you have earned a classified bonus. There are plenty of accommodation choices to pick from in the old town. I stayed at a home-stay that was run by a local family close to the night market. The home-stay was a cozy place with the necessary essentials but personalised service. Plus, they prepare a delicious personalised breakfast for all their stay-in guests. The owner also recommended a few excellent vegetarian restaurants to me. 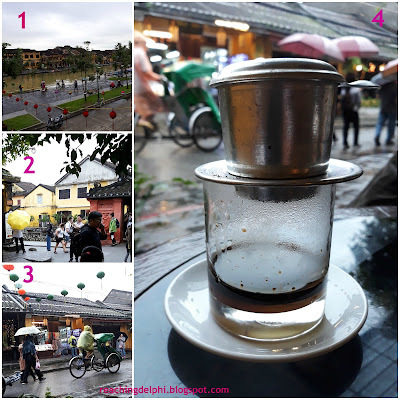 There are lots of things you could do in Hoi An. Just enjoying its authenticity over a cup of coffee can also be a preference. In fact the best, I would say. So today, I will leave you mostly with pictures and talk about only some main highlights. The Japanese bridge – this is a covered bridge built in the 16th century as goodwill between the Chinese and the Japanese. Today, this bridge retains its Japanese character of simplicity and elegance. There are old temples and houses on both sides of the bridge. In the picture below, you will also see a local friend I made at the bridge. 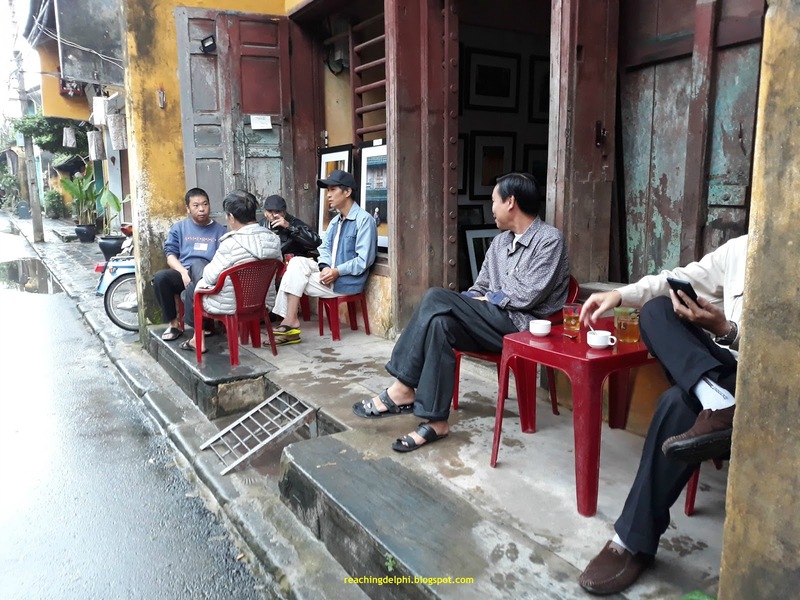 He is from Hanoi. The reason he posed for me? Look at his camera. This is like the very first camera (which belonged to my father, but I got to use it), I had snapped photos with. I just love the sound of that click and the roll moving. Quan Cong Temple – is an elegant ancient temple founded in 1653 near the central market area. Quang Trieu (Cantonese) Assembly Hall – this is a beautiful red building built in 1885 by the Chinese from the Canton region. It was once a place for Chinese fisherman and traders to rest temporarily. The complex is large and has interesting exhibits. This temple is the topmost in the next set of pictures. The rest are random shots capturing the elegance of this beautiful town. 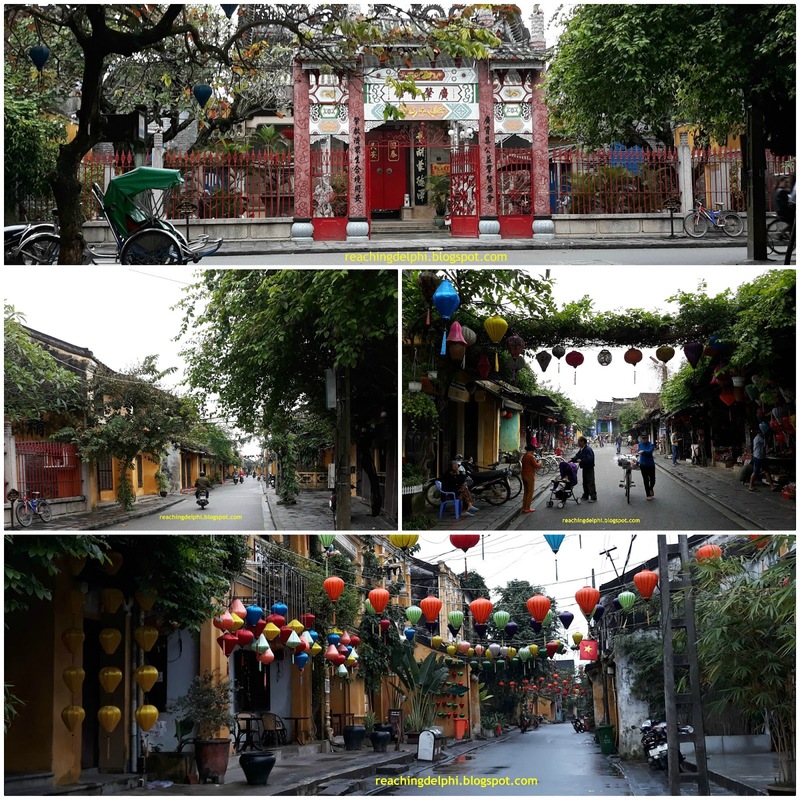 Lanterns are special here so you will see plenty all over Hoi An. These are functional ones, and they light up at night. The day and night view are different, both a must-see and must-feel experience. By the way, did you notice the numbers on these pictures? Keep looking. 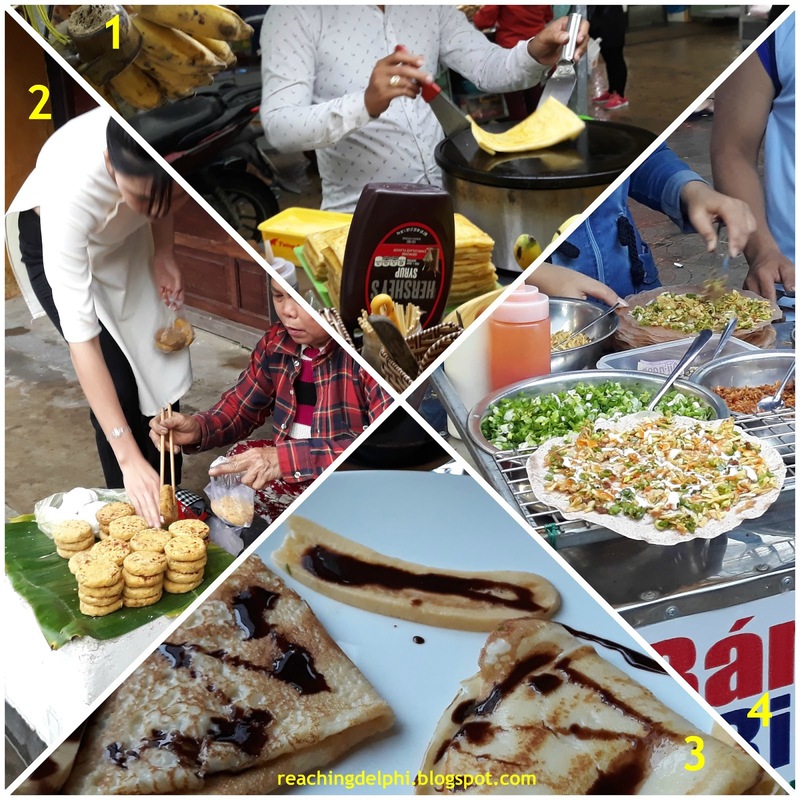 Street food is a favourite in Hoi An. Get your hands on some of those yummy crepes, customised crispy rice pizzas, sweet potato and ‘mango cake’. I expected mango in the mango cake, but it was filled with only peanuts. I don’t understand how Copperfield did that trick, but it is true. Nevertheless, it tasted delicious. Ice cream is famous here just as it is in many countries and what is more intriguing than eating the ice cream is watching the street vendors make handmade rolled ones. This is indeed an arresting performance. A base liquid is first poured onto a freezing flat surface. A few pieces of fresh fruit or cookies are added to the mixture. Once it thickens, it is spread thinly over the pan, then rolled and cut into pieces. It is then topped with nuts and more fruits. What are you waiting for, take out your camera? 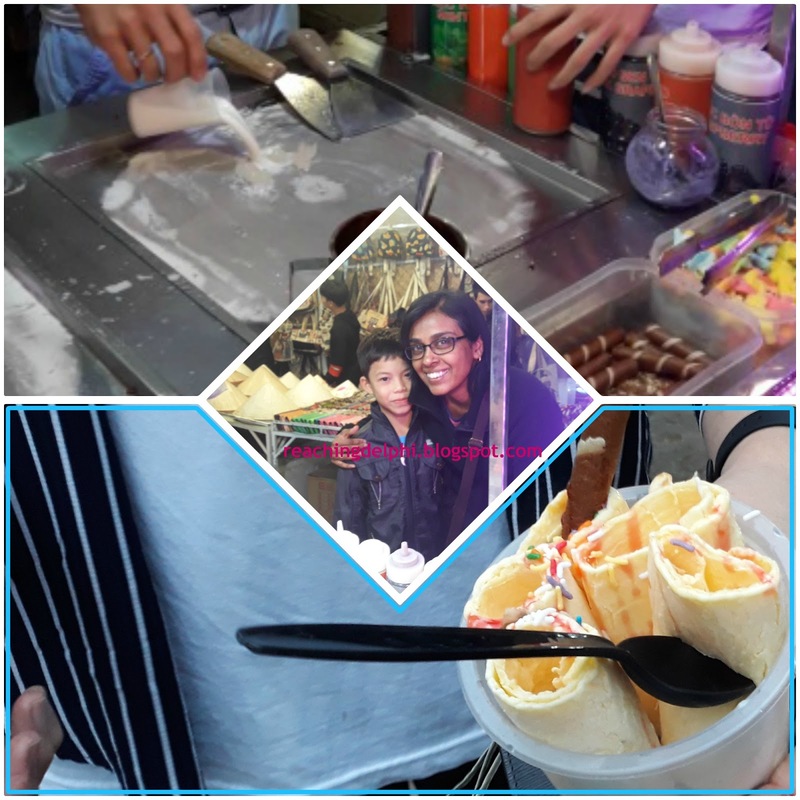 I got my rolled ice cream from the 3 'assistant' ice-cream chefs on duty, one of them is in the photo here. here then, be sure not to miss the winter solstice and lantern festivals. This is one of the most significant cultural events that takes place at the Bon River. 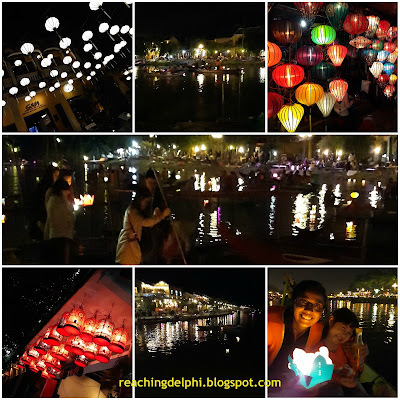 The Lantern Festival is one that is held every month. Colourful paper lanterns are lit and released into the Bon River every night after sunset. These are offerings to the ancestors and special prayers. I wished for peace and more coffee as I released mine. The daughter of the boat operator giggled nonstop as she held on tight to that Fanta bottle and demanded more photo snaps of us. 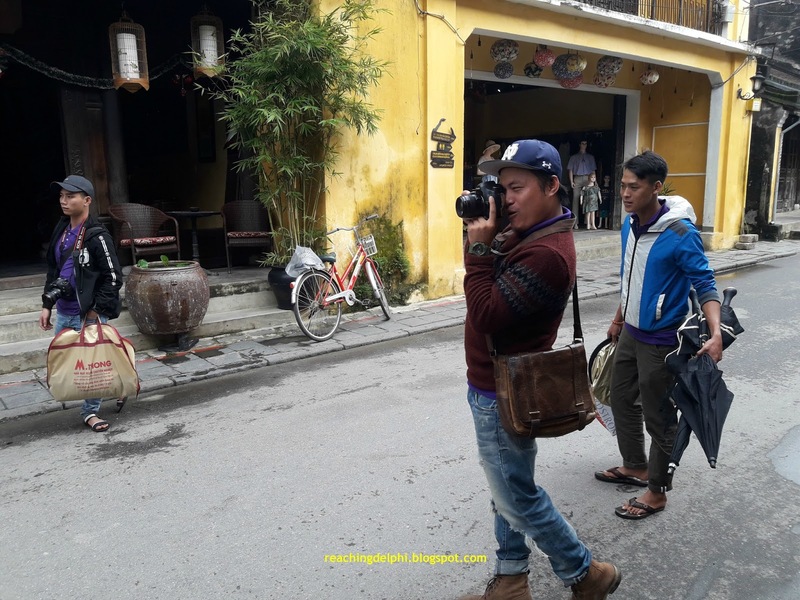 Did I not mention Hoi An is a photographer’s haven? It is, so the one thing you cannot do is to leave your camera at home. 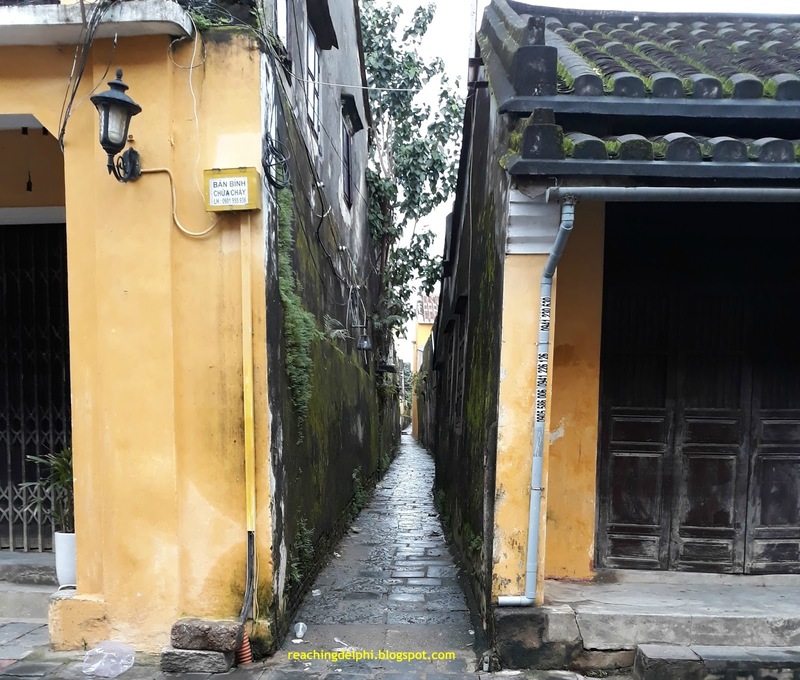 See the narrow lane below. This and other similar roads are very popular, and you may need to wait a few minutes to get your turn to own it for the moment. And there is the photographer in action, and who do you think his glamorous model is? Just look, the agent sits back and is enjoying his coffee. He knows the new model is poised to bring in lots of Dongs. So he thinks. Guess who the agent is? Hint, he is watching you. He also says it is not cool to wear 'Lombok' in Hoi An. Introducing the model … - if you want to know the rest of the story, meet me for some coffee. The agent has had his coffee and said I have earned one too after that strenuously drilling modelling session.😉. I searched different outlets before deciding which had the best aroma. The options are plentiful, this is Vietnam, of course, the second largest coffee producer in the world. You’ll never run out of coffee choices here. 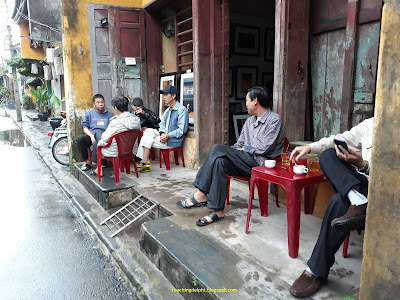 There was, of course, the street coffee near the harbour, a few on the way to the old town (where the locals were busy scratching lottery tickets – can you spot them in the picture?) and at the ancient city itself. On my last day here, I decided on a coconut iced coffee at a local roastery in the old town itself. I was lost for words. It was one of the best all-time coffees I have had in a very long time. It took me to paradise; I didn’t want to leave this place. 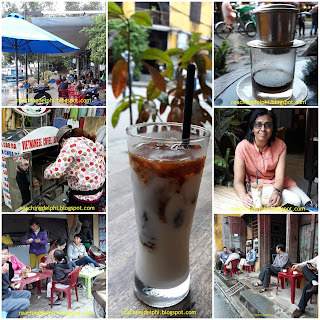 Coconut iced coffee is a simple concoction of coconut milk, condensed milk, and freshly ground coffee. Mamma Mia! Love the narrative style that puts one right into the experience and the vibrant and vivid pictures is the transportation that takes the reader there.